When I first heard that Boity was going into rap I was skeptical TBH. I was like oh my gosh, it’s Paris Hilton’s musical career all over again. Imagine being able to come for your ex and his protégé. Two birds, one stone. Too much was riding on this track. My tummy was in knots. The track landed Friday morning and I was pleasantly surprised at how good the song was. I took my tea break early just so I could go downstairs and listen to it. Yes, I was too invested. Her delivery, the production, the bars, the Nasty C, it all came together. 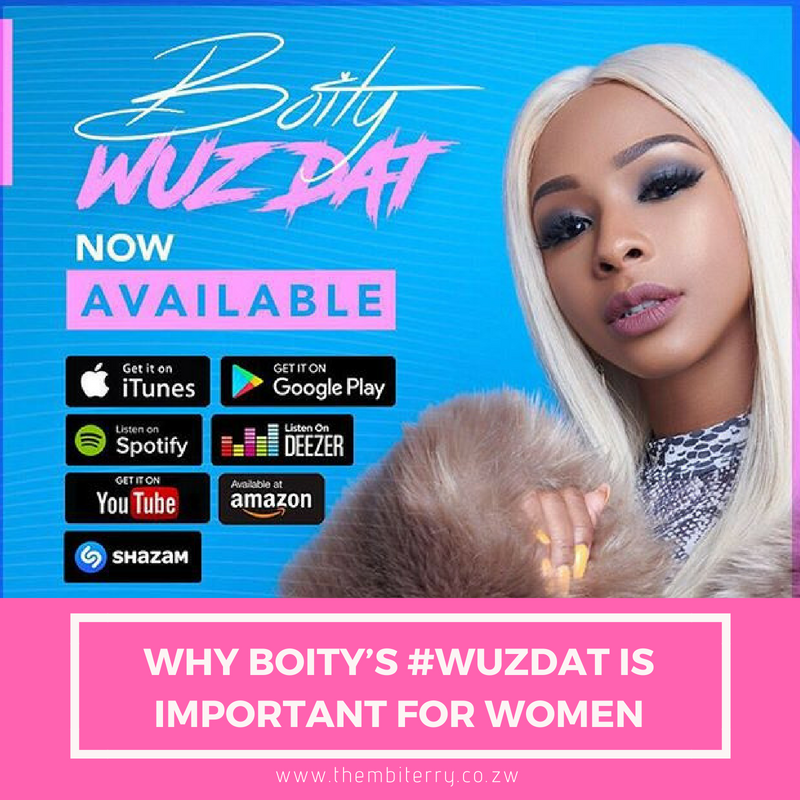 Boity is a model, actress, traditional healer and successful business woman amongst other roles. Adding FemCee was totally unexpected. And she did very well at it. I hope her follow up tracks will also be top notch. I pray to God. Back to my point, as women we have, in the words of Nasty C, “I was boxed in, all the boxes that I couldn’t check.” Who says Boity can’t rap if she wants to? Okay, besides Ntsiki Mazwai’s tweet. Zulugirl #5 has begun work on her rap career. I only heard about it three weeks ago and from the audios that she sent me, she has bars in typical Zulugirl style. Boity’s rap debut is important for little girls such as Zulugirl the 5th. #WuzDat came at the right moment and I hope it inspires my little sister to go harder. She has won multiple prizes for her writing and her blog is absurdly entertaining and I am glad she has found another hobby that she likes. Back to Boity’s song, here are 7 lines that I felt. Black woman, white man money getting back the land. This is line is self-explanatory and addresses oppression on several levels. What most people don’t realise is that black women are at the bottom of the food chain. Its white males, white females, black males and black females at the bottom of the tier. This is a huge societal problem. Transactional sexual relations where sugar babies are doing things for trips to Dubai and designer handbags and shoes. Louis Vuitton is not the end all in life. We need to raise our babies to be less materialistic. WOW! This is my favourite line in the whole song! I have never heard a cleverer way of telling people who you own foreign cars. This was exactly what I was looking for in a rap song. Lines that have depth and substance. I cannot say this enough! If you’re a follower of my blog then you know exactly how I feel about broke men. It can’t guys, it just can’t. I have my own money, please also level up and have your own stash o’ cash. The struggle of being a woman at this age with no husband and no kids. This really goes without saying. The relatives and the biological clock watchers need to lay off. It’s one of the principles of feminism that I am willing to go on the streets for, let women choose what they want to do with their bodies. If she wants to have a career first by all means let her. I was hoping we were over this when Cardi B made her acceptance speech at the VMAs. This was going well until we got here. I felt this line for all the wrong reasons. Why can’t we just celebrate our success, rub it in men’s faces without degrading other women. Hayi ah! 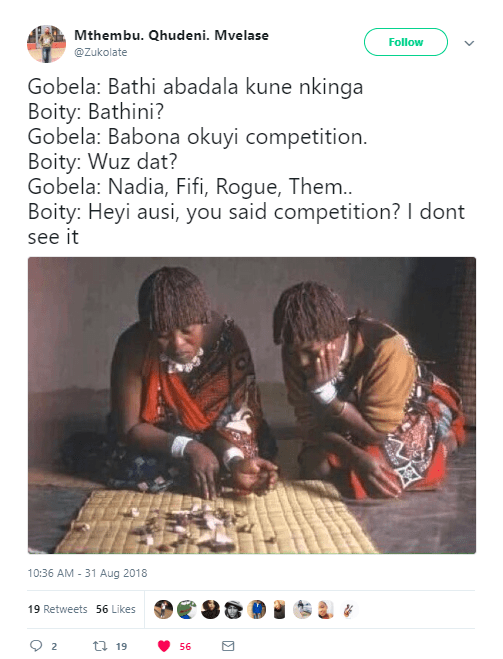 This was too funny because of Boity’s calling to be a spiritual healer. Still funny!